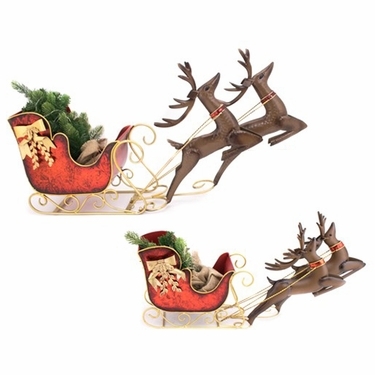 This set of Christmas Sleighs with leaping Reindeers is an ornamental Christmas display gift and a festive favorite! Both made from powder coated iron for longevity and quality, these pieces can display a number of different items in each sleigh such as a small trees as shown, to small and large gift baskets, and more. The smaller version can be used as a countertop display, and the larger version can be used as a large table centerpiece, a surrounding Christmas tree decoration, or truly anywhere holiday cheer and magic is needed!